Sent to the backyard for breaking a tick-tock-ticking toy, Sparky (an adorable but clumsy sheepdog puppy) immediately begins his favorite activity: diggety-dig-digging. 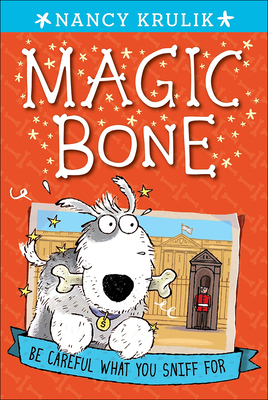 Little does he know, he's about to dig up the most amazing toy ever--a magic bone With one bite into that sparkling bone, Sparky is magically transported to London, where he makes new friends, sees the sights, and gets into a bit of trouble. Join Sparky on his adventure to see how he escapes and makes it back home. Nancy Krulik has written over 100 children's books, including two "New York Times" bestsellers and the highly successful "George Brown, Class Clown" series.